Savings.com is giving away $3000 worth of Visa gift cards courtesy of Expedia! Three (3) winners to each receive $1,000 Visa gift cards courtesy of Expedia. 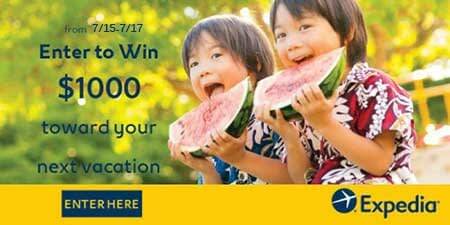 Users can enter the giveaway by heading to the Expedia page on Savings.com and submitting email address on the form at the top of the page. The winners will be chosen via a lottery drawing on Friday (7/18) and notified via the email address used to enter. Disclaimer: Work Money Fun did not receive anything for this post and is not liable for the fulfillment of prizes. However, this post contains affiliate links. Prizes shall be awarded by the sponsors.